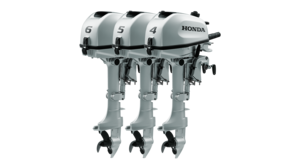 Compact, portable and easy to use, our new range of marine engines are packed full of the very latest Honda innovation. So it’s not just clever engineering, it’s Engineering For Life. 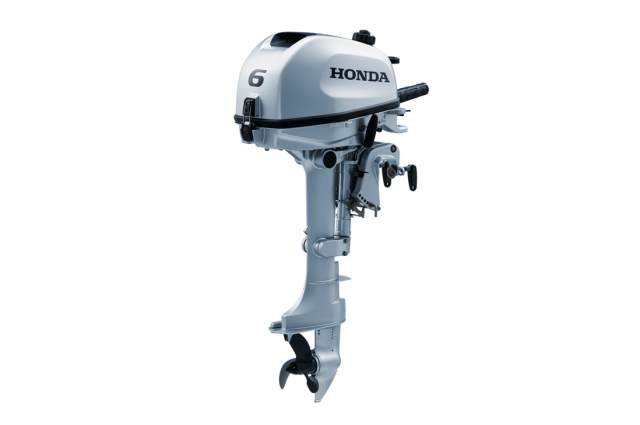 The Honda BF6 is one of Honda’s newest outboards. You can take them anywhere; they’re compact and light, strong on power and so easy to use. 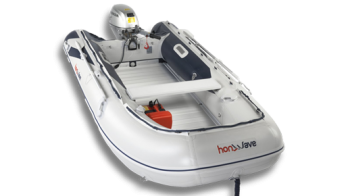 The engines are fitted with a ergonomic carry handle and with a foldable tiller handle. The engines have an ergonomic gear shift to move forward, reverse or be in neutral position. To prevent damage to the propeller, you can tilt the shaft forward when you find yourself at the water’s edge. A spring design allows you to lock it down again when you’re on the move. Vibration levels are extremely low thanks to innovative rubber mounts developed by Honda. The BF4, BF5 and BF6 incorporate a large internal fuel tank (1.5l). If needed, the BF5 and BF6 can be connected to an external fuel tank for longer journeys (optional). These engines feature an oil alert system, which will immediately warn you of any drop in pressure while automatically reducing engine revs to a lower and much safer level. The engines are equipped with Honda’s decompression mechanism, which requires the minimum effort on the recoil to start the engine. The BF4, BF5 and BF6 have been refined, re-engineered and comprehensively tested to ensure the highest possible levels of reliability, performance, comfort and enjoyment. Not only are the new BF engines among the lightest in their class, they have an ergonomically designed handle to make them easy to carry. The Tiller handle can also be folded to make them as compact as possible to aid storage.